These K-9s at work are ready for action. The California Highway Patrol Golden Gate Division Air Operations Unit on Wednesday shared footage of two focused, goggle-wearing dogs and their human handlers being hoisted up to and lowered down from a hovering helicopter during training exercises earlier this week at the Napa County Airport. The K-9s belong to the United States Coast Guard Maritime Safety and Security Team, which is tasked with protecting the San Francisco ferry system and other vessels entering Bay Area ports from potential threats, according to the CHP. Coast Guard and CHP crews conduct the semi-annual training to make sure the dogs and handlers are prepared to swiftly drop down and scope out any vessel in question that needs to be examined, according to the CHP. 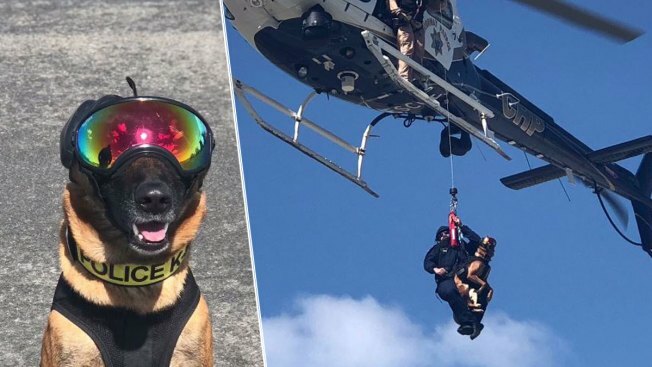 During the training exercises, the dogs, sporting noise-cancelling headphones and reflective goggles over their eyes, are first strapped into a harness before being lifted into the chopper. They are then flown around for a few minutes before being lowered back down to solid ground. The K-9s complete that routine twice during the trainings, according to the CHP. The trainings help the handlers make sure the dogs are comfortable with the noise levels of the helicopter and familiar with the process of being lifted up and lowered down, according to the CHP.